You might already have these chemicals in your cabinets or drawers. 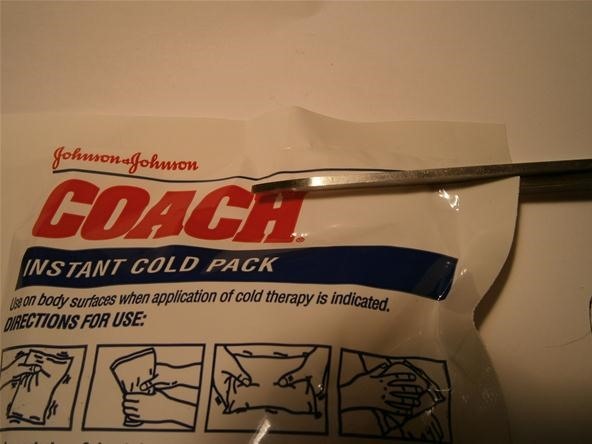 Cut off the top of your cold pack with scissors. Inside will be a packet of water surrounded by ammonium nitrate crystals. Only use packets clearly labeled as containing ammonium nitrate. 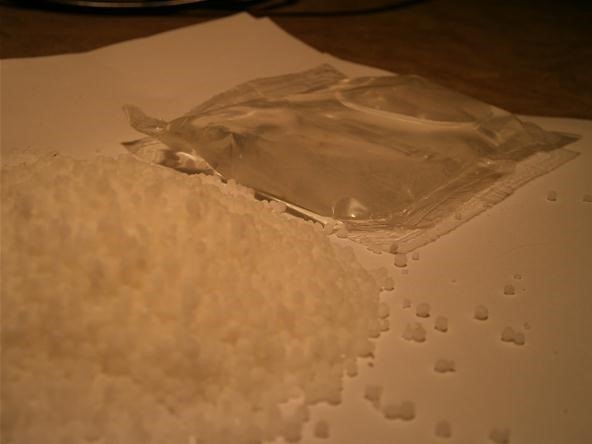 Urea is a common substitute for ammonium nitrate in cold packs. Do not use urea. Avoid cutting through the middle to keep from puncturing the bag of water inside. 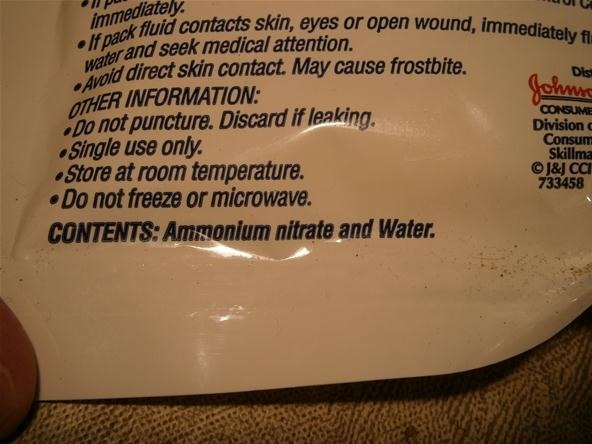 Make sure your cold pack contains ammonium nitrate and not urea. Cold packs demystified! It's just a bag of water surrounded by ammonium nitrate crystals. 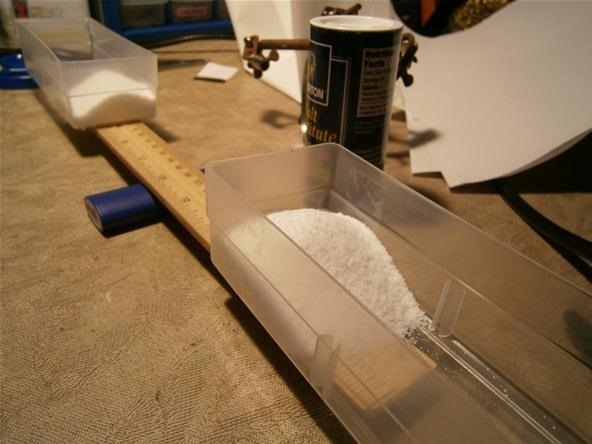 Using a digital scale, weigh out 40 grams of ammonium nitrate and 37 grams of salt substitute. 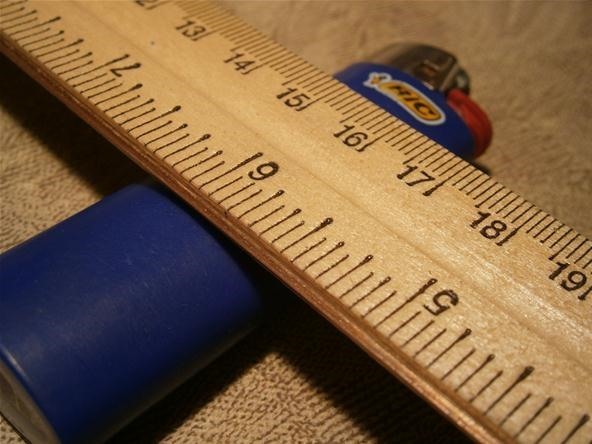 If you are like me and do not own a scale, you can make a simple balance beam using a lighter as a fulcrum and a ruler as the beam. I taped some component drawers to the ruler equidistant from the center marking to ensure they would exert equal force. Do your best to center the ruler. My salt substitute came in a 88.5 gram bottle. I poured half of the bottle on each side of the balance beam so that I had two equal measurements of 44.25 grams. I then dumped out one of these and replaced the salt with the ammonium nitrate until I had a total of 44.25 grams for both substances. This is close enough for our purposes. Any excess of either chemical will simply not dissolve into our solution. The experiment will not be noticeably affected. Above, 44.25 grams of salt in each container. Above, 44.25 grams of ammonium nitrate. Mix the measured ammonium nitrate into 100ml of water. 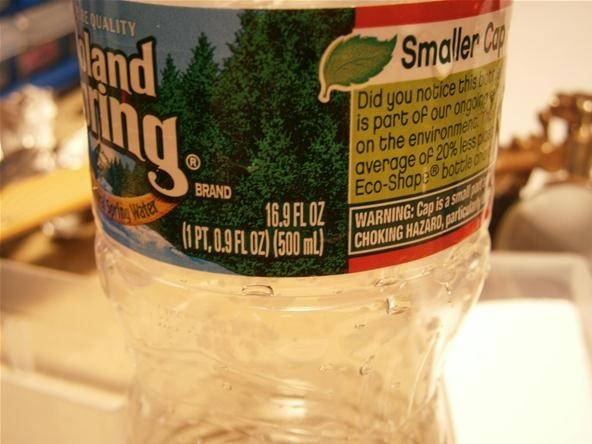 If you don't have a graduated cylinder, it's easy to approximate using empty drink bottles. I filled a 500ml water bottle approximately 20% with water and used that. 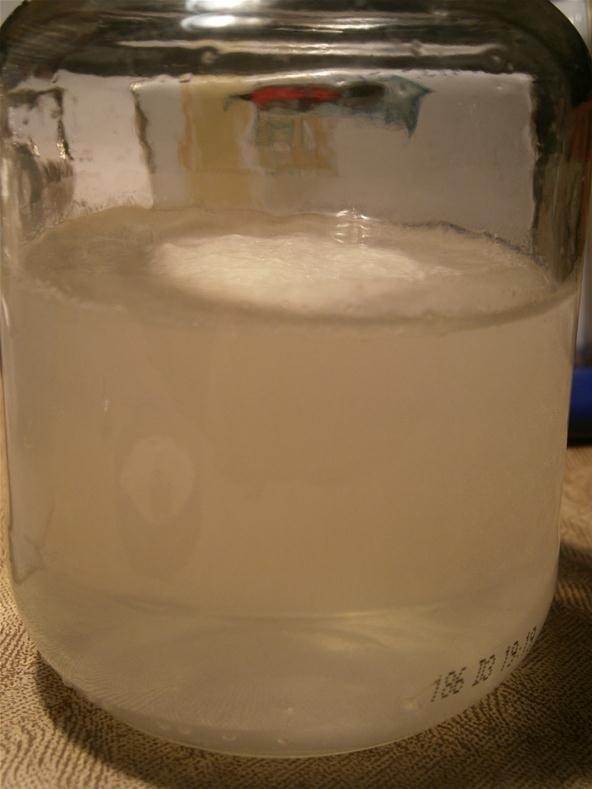 Stir the solution until the ammonium nitrate is completely dissolved. It's okay if the water is cloudy, as long as there are no solid pieces. The compulsive modernist urge to quantify and commodify means we can make lab instruments from trash. Still cloudy, but it's okay as long as none of the beads remain at the bottom. Pour your ammonium nitrate solution through a coffee filter directly into a container of salt substitute. Glass is always the best container material. 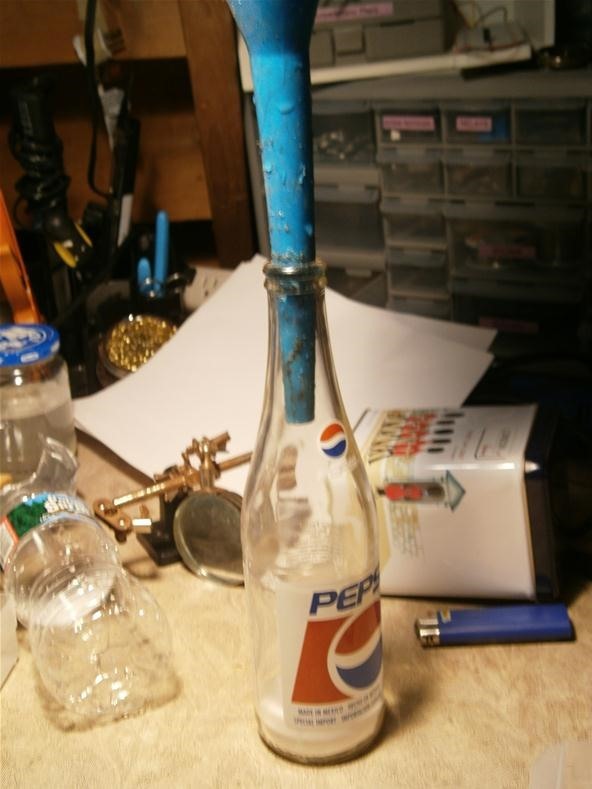 I used a glass Pepsi bottle and an oil funnel. If you can't do it from junk, it's not worth doing. Remember to add the salt substitute before pouring in the solution. 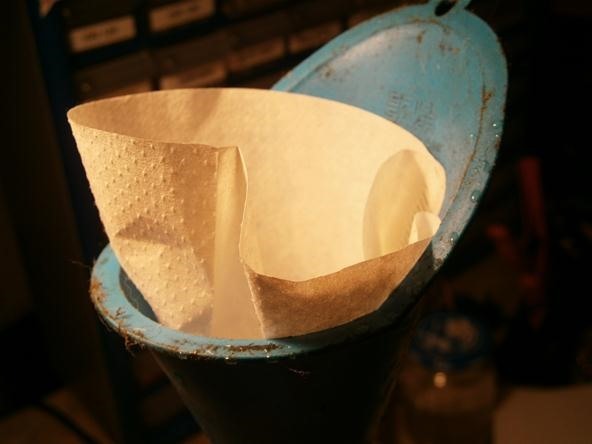 Coffee filters get any unwanted solids out of the solution. Gently heat, but do not boil, your mixture while continuously stirring. A few minutes is all it takes for the solution to become noticeably clear with no particles remaining. 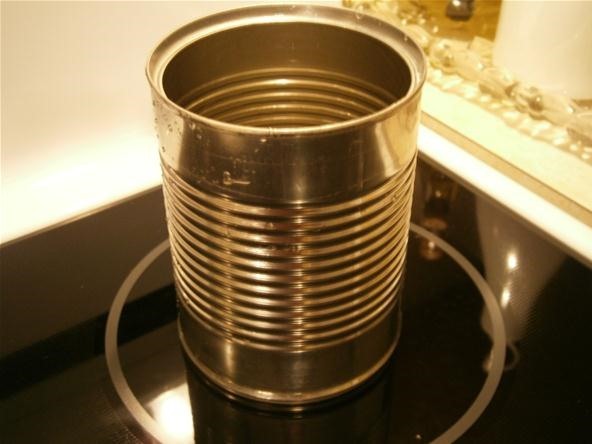 It is best to avoid using cookware when performing chemistry experiments. Everything is nice and dissolved! 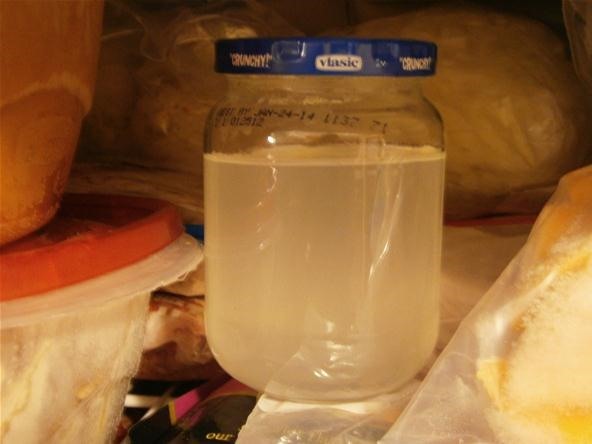 Place your fully mixed solution in the freezer for anywhere between a half hour and two hours. Crystals will form on the bottom of the container. 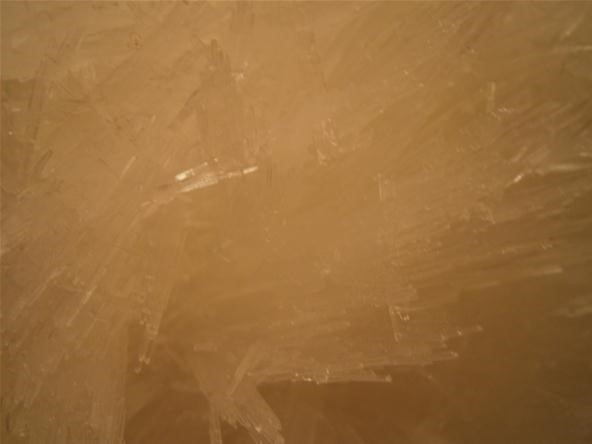 These crystals are potassium nitrate or saltpeter, the key ingredient in gunpowder. This is also available commercially as stump remover from your local hardware store. It is cheaper to buy stump remover, but in an emergency, using the cold pack is infinitely more James Bond. Place the container so that it will not tip over. Crystals hiding beneath the liquid. Pour out the remaining liquid in the container without pouring out your crystals. Wait until the crystals have dried. Even though they look like rocks, in reality they have the consistency of slush. Let the open container sit in a well-ventilated area. When dry, crush the crystals into a very fine powder. The chances of igniting the saltpeter are very low, but for safety's sake, this is best done in a non-metal container. Mix together one-part saltpeter with one-part powdered sugar. This will give you a crude form of gunpowder. Real gunpowder contains saltpeter, sulfur and charcoal. However, this home recipe should be more than enough for all your pyromaniacal needs. A well mixed flammable powder is a happy flammable powder. Take a small spoonful of your gunpowder and place it on a nonflammable surface outdoors away from sentient creatures and trees. Light using a long match and revel in the power now at your command! Essentially, what we are doing is switching around the compound words in the chemicals. We are inducing the two chemicals to exchange ions so that ammonium nitrate and potassium chloride become potassium nitrate and ammonium chloride. 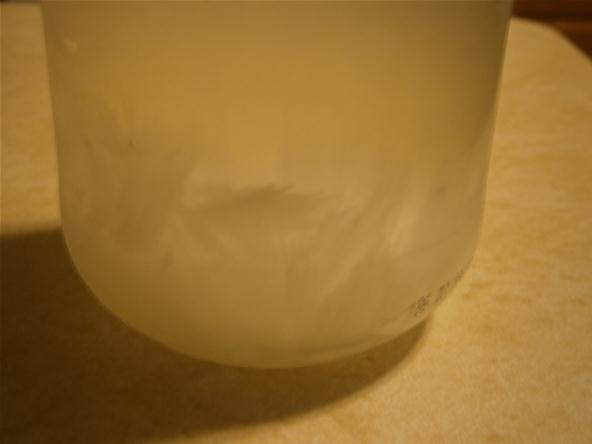 The potassium nitrate crystalizes while the ammonium chloride remains a liquid. Try making a trail of gunpowder like in the cartoons. What kind of cool designs can you make? If you do this experiment at home, post it up in our forum. We would love to see your awesome pictures and videos on the corkboard, as well. The scale was a good idea. I may make a modified version myself for demonstration purposes. While the experiment itself certainly isn't a refined way to manufacture high quality black powder, it's a good demonstration in basic chemistry. Thanks Ben! I agree it is not high quality black powder, but It is much easier to make. I'm glad you enjoyed it! Thanks for joining the Mad Science World! Sorry to disappoint! There are lots of gunpowder tutorials on wonderhowto you can check out though. How dry does the potassium nitrate need to be before mixing it with the sugar? Should it still be a little slushy? Or completely dry? Thanks. That's what I thought. I'm just impatient. Time to break out the fan. If you have any clamp lights for photography or just any flood light at all you can place the crystals on some foil under the light. I dry my crystals this way for a few hours. While they are still very slightly damp I grind them in my mortal and pestle and put them back under the light. I'll try that out. I've got a few clamp lights laying around. Thanks! 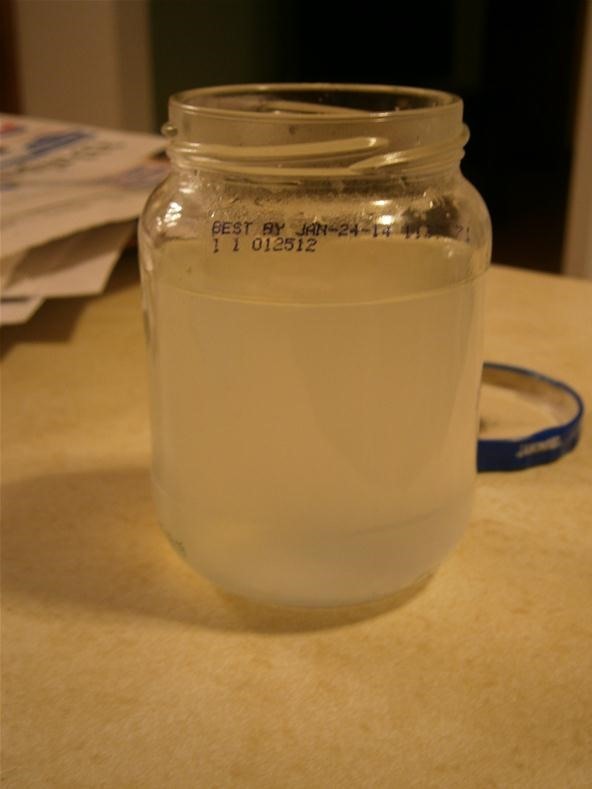 By using the electrolysis of strong table salt brine with 12V at lots of amps (i.e. 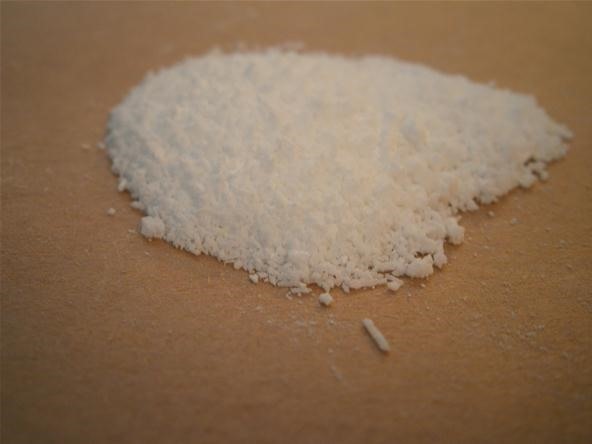 PC Power Supply or a car battery and a couple of big carbon battery rods) you can create sodium chlorate. This will produce a similar reaction with sugar but is more prone to absorbing water from the atmosphere. Using epoxy instead of sugar will render the combustible mixture relatively waterproof. You can make charcoal gunpowder just like you normally would using this saltpeter, but don't add the sugar. The sugar replaced all the normal gunpowder ingredients in this article. its amazing .its power full but it can be with sulpher charcoal and nitrate. wow impressive, gov cannot ban simple chemicals just like thermite. I think if you had the chemicals finer and mixed them it would help the chemical reaction. Could you mix the saltpeter with charcoal and a sulfer based cleaner? Thanks for telling us about postassium nitrate being available as stump remover. Ammonium nitrate is available as fertilizer, but is fairly well regulated because of the Oklahoma City bombings, which used a "fertilizer bomb". Either of these oxidants with epoxy or polyester resin make for pretty decent solid rocket fuel that stores well. All natural sea salt won't work. The reason being that natural sea salt is more or less the same as table salt - just sodium chloride. You specifically need potassium chloride. It might be labelled as "potassium salt" or "low-sodium salt". Great video, but I have a question. Is it possible to put this powder into a .22 LR bullet casing and reuse the bullet?
" Is it possible to put this powder into a .22 LR bullet casing and reuse the bullet?" No. a 22 has a rimfire primer, which is not replaceable, unlike the centerfire primers used for reloading other brass. Wrong Dragon Breath! If you crush up strike-anywhere match heads carefully in a water paste, drop the paste into spent .22 cartridges around the bottom rim. Let dry completely, and voilà! 'Can't be any less corrosive than this poor man's powder.... Just remember to place the new cartridges where you strike a new part of the rim. William Finucane, This was a cool and interesting post to read. I am not really sure what I would personally do with homemade gunpowder, but it is still very cool. I liked the description that you added in the post, it made it very easy to understand and will be quite easy to make now if I ever decide to make it. Good job on the post. Would you need to have a fuse if you were to set this off somewhere? I am pretty sure that lighting gunpowder a couple of feet from your body isn't smart, but I didn't know if there was a delay in the powder. I've made this mixture (salt petre/powdered sugar)... and used 70% pure hydrogen peroxide and made a dough out of the mixture... allow it to drydry over night. Then crush the dried rock into a powder. This mixture works very well. For a hot burning fuse... dissolve a teaspoon of salt petre in a tablespoon of water... use a small gauge strip of cotton rope and allow iabsorb the solution. When it dries, light it and it will burn, like a firecracker fuse. Can I use just regular salt or do I HAVE to use a salt substitute? 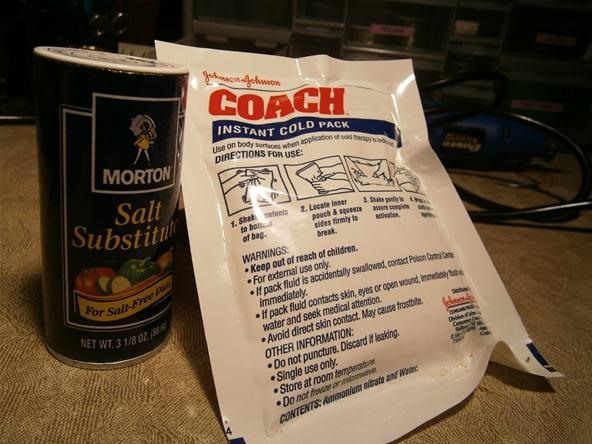 You have to use salt substitute. Regular salt is sodium chloride, the substitute is potassium chloride, and if you don't have potassium in the equation you won't get potassium nitrate, which is the required output. 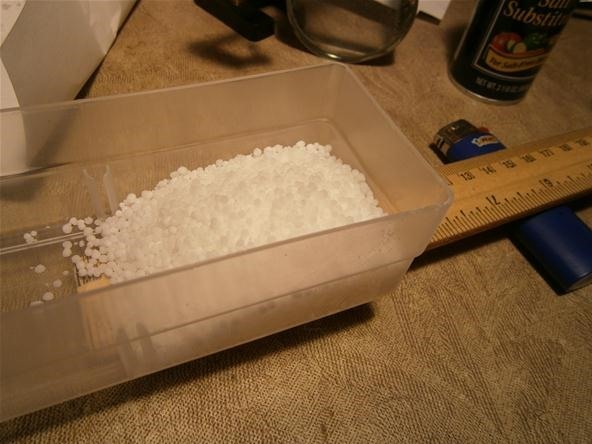 Technically you could use regular salt, but the result would be sodium nitrate, which chemically is very similar and would be usable for pyrotechnics but wouldn't be suitable to make black powder for use in firearms. 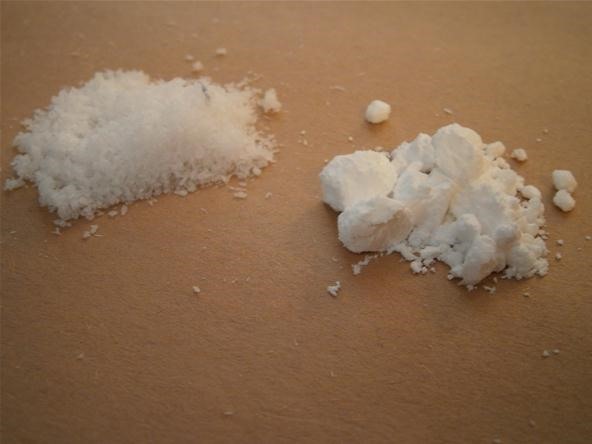 Two parts potassium nitrate, mixed with three parts sugar can be heated over a very low heat slowly and stored constantly until it very slowly melts into a paste. Then pour it into any container you no longer want to keep and dribble some up over the edge of the container. That part is used to light the mixture when it dries. The result is a very hot smokebomb that also burns with a very bright flame and will burn up the container it is in. Don't use inside because it will likely cause a fire. One pound of the compound will produce enough smoke to fill a city block with thick white smoke. Don't look at the flame directly since it is very bright and don't stand close to it. Is that powered sugar ? Just says sugar but the picture looks more like powered sugar. I assume you mean powdered sugar. I tried this, but I used sugar that I powdered myself. This might work better than normal powdered sugar, which often has corn starch/other flours in it. The flames I got where 2/3 feet high, it was very exciting. If you slowly heat up the mixture and stir it you will create a solid state rocket fuel and thanks for showing me how to make saltpeter.